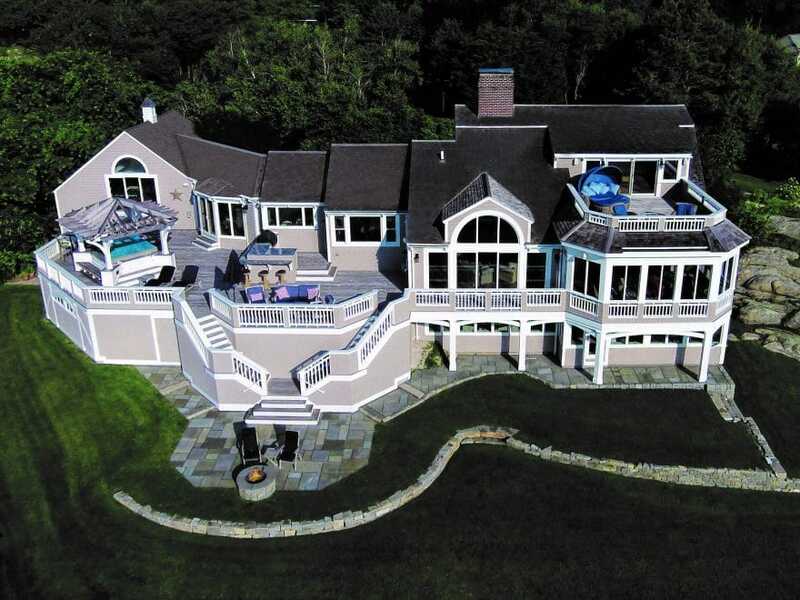 Since 1997, Howell Custom Building Group (HCBG) has been bringing high-end residential building projects, and a sense of community, to the people of Massachusetts’ North Shore. Founded by husband-wife team Steve and Susan Howell, HCBG completes new building projects, renovations and additions for clients throughout Essex County, just north of Boston. While the company primarily works within the state, HCBG has completed a number of vacation homes for longstanding clients in both New Hampshire and Maine. In addition to their upscale residential building projects, HCBG has worked extensively with the Merrimack Valley Habitat for Humanity, leading two Home Builders Blitz initiatives for the nonprofit, serving on the board and helping to host its recent 30th anniversary celebration. A former software engineer and marketing specialist, respectively, Steve and Susan started HCBG after becoming interested in timber frame construction. Having worked on a crew framing houses during his college years, Steve was looking for a change of pace from his job with Hewlett-Packard and the couple decided that their unique combined skillsets might serve them well in the residential construction market. “The goal was to do something we were passionate about and serve our local community and we felt like we could bring a more professional approach to residential construction,” says Susan. Working out of a revitalized mill building in Lawrence, Massachusetts, Howell says it’s the company’s attention to detail, project management expertise and commitment to quality workmanship that set it apart in the market. HCBG completes a number of specialty trades such as finish carpentry in-house, ensuring consistency across all projects. The company also employs its own project management team, allowing HCBG a greater level of oversight. “We put a lot of time and detail into the planning of the project during the design process and are very involved in preconstruction services, which help to minimize any surprises.” says Howell. By drawing on his background in software engineering, Steve was able to develop a proprietary estimating system that allows the company to maximize the value of every project. “It allows us to solve building issues and identify cost savings before we get into the construction phase of a project,” he says. Over the last 19 years HCBG has completed hundreds of new building projects, home renovations and additions. Typically completing custom home projects within the $1 to $5 million range and renovations between $150,000 and $500,000, the company has earned a stellar reputation for quality and craftsmanship that’s led to no shortage of repeat business. “We also do smaller projects for former clients, like a kitchen, master bathroom or exterior renovations and additions like decks,” said Howell. The company is currently renovating a 100-acre farm in Boxford, Massachusetts, transforming the site into the state’s first sheep cheesery. Other notable projects in the HCBG portfolio include a North Shore contemporary-style house that earned a PRISM Silver Award from the Builders and Remodelers Association of Greater Boston, and the Lake Front Lodge, a striking home with exposed natural wood and stone elements which earned a PRISM Gold Award. An active member of Merrimack Valley Habitat for Humanity for almost a decade, Howell says that HCBG’s involvement with the nonprofit is not only the right thing to do, but also a valuable marketing asset. “When clients work with us they know that some of what we earn on their projects will go toward these causes, so it’s really like we’re bringing them into the process,” says Howell. Both Steve and Susan serve on the local Habitat board, with Susan taking on additional marketing responsibilities. Over the last six years, the couple have leveraged HCBG’s resources to help the organization meet its mission of eliminating poverty and homelessness by providing homeownership opportunities to those in need. HCBG has been involved in Habitat’s Home Builders Blitz projects in both 2012 and 2014. The Home Builders Blitz differs from the typical Habitat for Humanity project in that crews consist of volunteers who are also skilled construction industry professionals. By relying on these experienced workers, a Home Builders Blitz is able to accomplish in a week what might take an unskilled Habitat crew almost a year to complete. For its part, HCBG oversaw both the 2012 and 2014 Builders Blitz’s, putting together a team of professionals to lead each phase of construction and soliciting donated professional labor as well as discounted materials from the vendors and subcontractors that the company works with on a regular basis. The company’s involvement with Habitat for Humanity is not limited to the Home Builders Blitz projects. Susan was recently tapped to serve as co-chair for Merrimack Valley Habitat for Humanity’s 30th anniversary party, which was held at the warehouse of HCBG’s primary lumber supplier, Jackson Lumber. While Howell says it can often be difficult to balance the business side of things against the company’s charitable efforts, it’s a consistently rewarding experience. “It feels like it completes the cycle. Typically we build for people who can afford beautiful homes in safe, upscale communities but here we’re able to utilize our success for families who couldn’t otherwise afford this,” she says. A unique approach to custom home building and a commitment to helping the local community through its charitable efforts with Habitat for Humanity will surely spell success for Howell Custom Building Group throughout Boston’s North Shore.